Kenyan Drake on Miami Miracle: I couldn´t let Gronk tackle me! Kenyan Drake explained there was no way he was going to let Rob Gronkowski tackle him after scoring the sensational match-winning 'Miami Miracle' touchdown against the New England Patriots. The Miami Dolphins running back was still in disbelief after his side stunned AFC East rivals the Patriots on the last play of the game on Sunday, recording a 34-33 home victory courtesy of a 69-yard lateral play as time expired. Quarterback Ryan Tannehill completed a pass to Kenny Stills, who pitched to fellow wide receiver DeVante Parker as the crowd began to realise a stunning finish was possible, despite the last-ditch play rarely generating success. Parker then found Drake, who cut inside from the right sideline and did the rest in a 52-yard burst into the endzone, helped by some crucial blocks as the final act saw him beat Gronkowski – the star Patriots tight end who was in on defense for the play – prompting ecstatic celebrations from players and fans alike. Drake told reporters: "That was the last part of the play that was scripted, when I got the pitch. It was sandlot football. "It was just me and Gronk. I couldn't let Gronk tackle me in that situation. I said, 'Look, sorry Gronk,' he's a great player but I got somewhere to be. "It's just something that we practice every Saturday in walkthroughs. Obviously in a situation you never know what will happen, it was just by the grace of God we were able to hold our composure and just make a play." Asked if there was a moment during the play he realised a touchdown was possible, Drake replied: "Until I got in the endzone. "Honestly, I'm still sitting before you all and I still don't believe it. I just saw it was Gronk in front of me and I said 'I've got somewhere to be' – I had to get in the endzone." 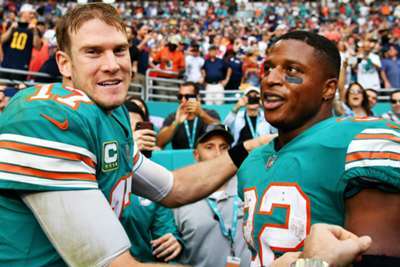 Quarterback Tannehill hailed the fight of the Dolphins (7-6) after a victory that kept them in the playoff hunt as he gave his take on an emotional moment. "Drake runs a 4.3 [40-yard dash] and Gronk probably runs a 4.6 or 4.7. We feel good about that matchup. "So, yeah, it was pretty amazing. I was following behind and I actually just turned around and collapsed just with the emotion of the whole thing. "There's no quit in me. There's no quit in this locker room." Tannehill revealed the Dolphins had practiced that specific play as recently as Friday, scoring against the scout team, and head coach Adam Gase confirmed to reporters the play had worked exactly as it was drawn up. He said: "They executed it! We have got to have something for those type of situations. We work on it every Friday and Saturday. "It's boring because you might go three years without calling one of them. But these guys stuck with it, especially this year, and they executed that one for sure." And Stills was aware he had been part of a play that will live long in the memory. "The Miami Miracle sounds nice," he said.